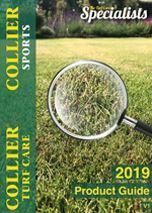 When you purchase a granular fertiliser product from Collier Turf Care you can be assured that you are receiving not only a premium fertiliser, but that you are buying from a company with years of experience in the industry, backed up by technical understanding and a team of professionals to assist you if needed. Below is our complete range of premium grass and lawn fertiliser for a variety of applications including sports turf, amenity and semi-professional lawns. Click one of our product images below to checkout.